I am a second generation chef. I started at the age of 14, in my family’s cafe “Steak Away”, in Merimbula. At 19 years old, I was running the Merimbula pub kitchen. I worked a snow season in Jindabyne with Francis Hernon. I was very green and he was a great teacher. I bought a restaurant in Gippsland at 22 which closed due to family tragedy. I then worked as a sous chef in several small busy restaurants in Canberra and along the coast. At 25 I was head chef of Roberto's in Manukas in the ACT. 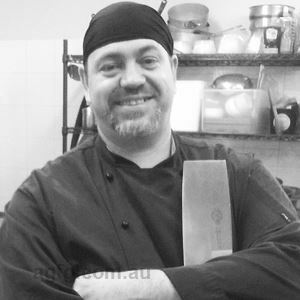 I finally got serious about my career and was RPL’d and was qualified as a chef in 1995, that same year, I moved from Canberra to the Hyatt in Coolum, working with Kim Anderson starting out as a chef de partie and was promoted to sous chef. Three years later, I returned to Canberra to the Commonwealth Club as sous chef. I worked for Mosaics, Belluchi and The National Museum, before starting work at the Hyatt Canberra with Timothy Bruce in 1998. I left the Hyatt Canberra as a chef de cuisine to open Movenpick in Istanbul as an executive chef. I skipped the executive sous chef level and dived into the deep end with no Turkish language or exposure to Turkish culture. Rene Dietsche, the vice president and Richard Applebaum, the general manager for Movenpick resorts, took a big risk and let me go crazy with that hotel, it really was a great property to work at. I moved from Istanbul to Movenpick Dar es Salaam in Tanzania with an offer to re brand The Royal Palms with Daniel Roche who was the general manager. The property had 5 outlets and banqueting for up to 1000 people. It was a big challenge, everything was old, tired and damaged. We did some crazy things, kudu tartar prepared live in the restaurant lobby and crab night, with crabs done so many ways we lost count. Mud crabs were $2.50 kg! Opening an Italian restaurant we had to grow our own tomatoes, basil and rocket, as they just didn’t exist in Dar. I left Tanzania to work in Ireland simply to return to my roots, I was the 1st of my family to live in Ireland for 5 generations, I love Belfast and felt very at home. I was invited by Rainer Becker and Zuma Group to open Zuma, Istanbul as executive chef. I spent 3 months in London eating only Zuma food and Japanese cuisine to train my palette. Only on Sunday's did I allow myself to eat bacon and eggs. I may have had a few kebabs and some dirty bird (KFC) late at night. Zuma, Istanbul was a wonderful restaurant with some unique challenges, we had a great team of strong performers. After Zuma, Istanbul, I was invited to London by Paul Brackley take over as executive chef de cuisine at the Crown Plaza in London and to open the Chinese Cricket Club with it's modern Sichuan cuisine. In 2011, I returned to Tanzania to work at Karambezi restaurant at the Seacliff Hotel, to be closer to my wife’s family and for a sea change. London or a tropical paradise….mmmm. In 2012, my wife and I decided to move to Australia with our two kids. We purchased the Emerald Bank wool-shed in Kialla, Victoria and started EWP Catering as a family venture with my brother Bill Speed and niece Katy Speed. In June 2015 we opened 7 Creeks on Fryers bakery. Since I was 5 years old, my only desire was to be a chef. I watched my older brother throw steaks and fish on the grill at the Victoria Hotel in Shepparton with sweat rolling down his temple, flames and the organised chaos and adrenaline of 600 covers a day back then. I knew this was my natural habitat. Simplified with Mediterranean roots and Asian overtones. I have been using different molasses, carob, grape and pomegranate. Everything. Mostly being ready for service. Charlie Trotter, Francis Hernon, Kim Anderson, Rainer Becker, Morimoto and Fuschia Dunlop. Everything is new but nothing changes. Hunan poached chicken with bang bang sauce (Japanese, Chinese and Korean chili sauce with Sichuan pepper, ginger and sesame paste) with edamame, cloud ear mushroom, coriander raw garlic and chili salad, with a soy and sesame dressing. This is served cold.